Creamed Spinach and Mushroom Smothered Chicken. 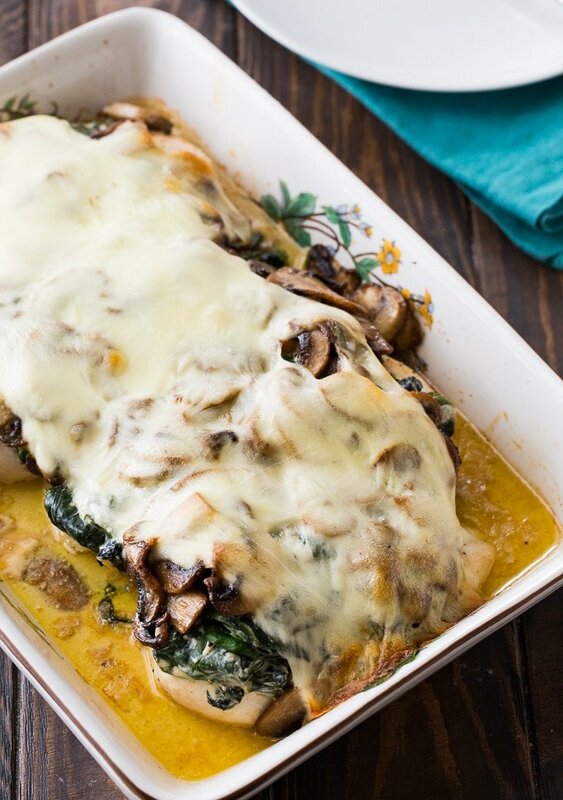 Baked boneless chicken breasts are completely covered with creamed spinach, flavorful sauteed mushrooms, and a whole lot of gooey, melted mozzarella cheese. If you’re a fan of creamed spinach, you must try this recipe. It is pure comfort food. The boneless chicken breasts are baked by themselves for 18 minutes. To reduce the time needed to make this recipe, prepare the mushrooms and creamed spinach while the chicken breasts are in the oven. The mushrooms get sauteed in butter flavored with garlic powder and Worcestershire sauce. Cook them until they are golden brown for the best flavor. The creamed spinach comes together quickly and you can make it in a separate pan while the mushrooms are browning. Wilt the spinach in a butter/oil combo that has been used to saute a little onion. Then stir in some Parmesan cheese and cream cheese until they melt. Add a few crushed red pepper flakes if you want some heat in this Creamed Spinach and Mushroom Smothered Chicken. 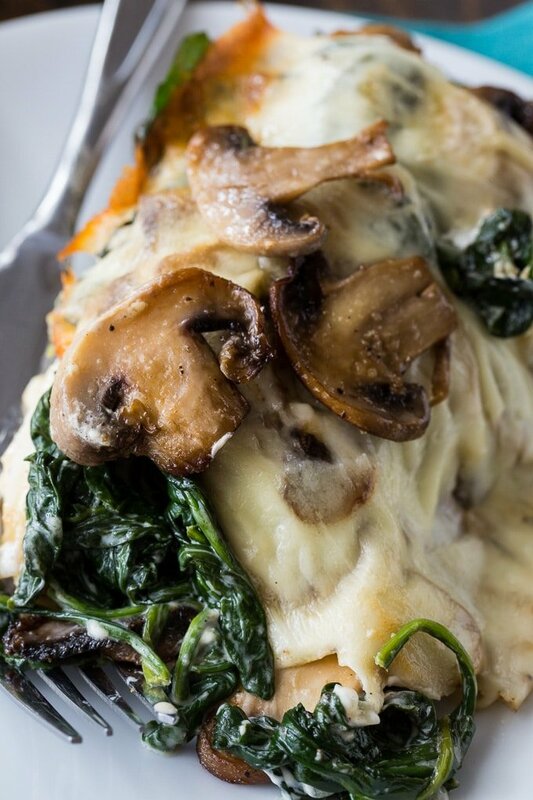 Once the chicken has baked for 15 minutes, remove it from the oven and top with spinach, mushrooms, and some sliced mozzarella cheese. Return it to the oven for another 16 to 18 minutes to fully cook the chicken. 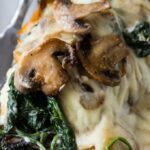 Baked boneless chicken breasts are completely covered with creamed spinach, flavorful sauteed mushrooms, and a whole lot of gooey, melted mozzarella cheese. Preheat oven to 350 degrees and lightly grease a baking dish that's big enough to hold 4 chicken breasts. Make mushrooms. Heat butter and oil in a large pan over medium-high heat. Add mushooms and cook until water has evaporated and they are golden brown. Add garlic powder and Worcestershire sauce. Season to taste with salt and pepper. Remove mushrooms from pan and set aside. Sprinkle seasoned salt, pepper, and garlic powder on both sides of chicken breasts and place in prepared baking dish. Bake for 15 minutes. While chicken bakes, make creamed spinach. Heat butter and oil over medium heat in the same pan you cooked the mushrooms in. Add onion and cook until soft. Add spinach a few handfuls at a time, adding more as it wilts down. Once wilted, add seasoned salt, cream cheese, Parmesan cheese, and red pepper flakes. Turn heat to low and stir until cheese is melted. Remove from heat. Once chicken has baked for 15 minutes, remove from oven and flip chicken over. 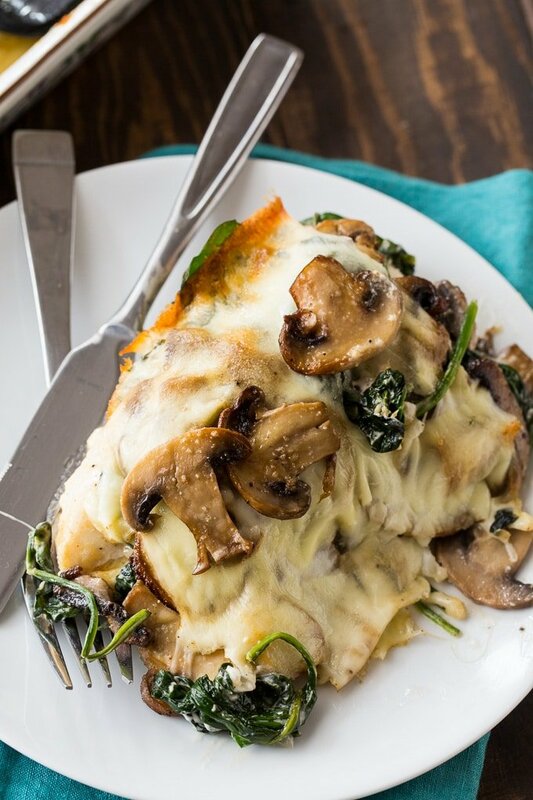 Top with spinach, mushrooms and mozzarella slices. Place chicken back in oven and bake for 16 to 18 minutes, or until chicken is cooked through. You don’t want to miss this Bourbon Pecan Chicken. The flavor is amazing! Watch the short video below to see how to make it. This entry was posted in Main Dishes and tagged chicken, spinach. Bookmark the permalink. This recipe is amazing. Everyone is always asking me to do it. I get requests for it a few times a month. I always have to make extra mushrooms. Because that Worcestershire on the mushrooms OMG amazing. I made this and really enjoyed it. It paired it with long grain rice and the flavor was fantastic. This sounds scrumptious! I would like to make this for family Christmas dinner. Do you think I could prep it on the 24th and bake it 24 hours later? Also, any suggestions for sides? Thank you in advance! Oh my! This is in the oven right now!!! I can hardly wait to try it!!! I made this last night for dinner. We were amazed with how much flavor it had and how filling it was! Delicious!! We will definitely be making this again. We split the last piece of chicken and brought it in for lunch and everyone at work was asking me what that delicious smell was! Already shared the recipe. Note regarding seasoned salt: I sprinkled a little bit of onion powder, garlic powder, smoked paprika, sea salt and pepper on my chicken. I also sliced the chicken in half, not all the way through as I stuffed some of the mushroom spinach and cheese mix in half of the chicken and used the remaining place on top. I also used shredded mozzarella as opposed to slices as this is what I had in the fridge . Definitely a must try! I made this last night for dinner. We were amazed with how much flavor it had and how feeling it was! Delicious!! We will definitely be making this again. We split the last piece of chicken and brought it in for lunch and everyone at work was asking me what that delicious smell was! Already shared the recipe. Note regarding seasoned salt: I sprinkled a little bit of onion powder, garlic powder, smoked paprika, sea salt and pepper on my chicken. I also sliced the chicken in half, not all the way through as I stuffed some of the mushroom spinach and cheese mix in half of the chicken and used the remaining place on top. I also used shredded mozzarella as opposed to slices as this is what I had in the fridge . Definitely a must try! I made this last night and it was AMAZING! Soooo delish! Followed the recipe as written and it turned out beautiful. Looked just like the pictures. This ones a keeper!! Oh dear ! Sounds promising ! Thankfully keeping !